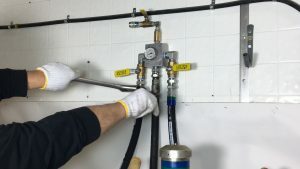 Two component spray foam systems, for sprayed in place or spray on polyurethane foam insulation blends, are primarily packaged in steel 55 gallon barrels and distributed by their weight in volume as a paired set. A Paired Set is two barrels consisting of one “A” side (Activator/Isocyanate) and one “R” side (Resin/Polyol) ranging in a combined liquid weight from 970 lbs. to 1050 lbs. It should be noted that in many instances the components are referred to as “A” and “B”, respectively. In general the spray foam systems are produced having at minimum six months shelf-life within the original unopened barrel. Stored between 60 and 75 degree F (15 – 24C), do not require additives, B sides may require mixing and/or continual agitation. Spray polyurethane foam material is one of the ongoing expenses you’ll have as an equipment and business owner. That means it’s one of the biggest areas in your business that you can cut costs by reducing waste when storing or spraying SPF material. Use the following four tips to effectively minimize SPF material waste in your spray foam insulation business. Spray foam material is packaged, sold and shipped on the basis of weight. Therefore, in order to figure the volume of a product packaged in the drum, converting the weight of the product within the drum into gallons is required. To do so, the specific gravity or weight per gallon of material is required information. There is likely to be a difference between manufactures, so confirm with the product supplier to provide this info or if a scale is available, weigh the container first. Specific Gravity and per gallon weight of the liquid for some manufactures are provided on the SDS or product data sheet (formerly MSDS). The “A” component, while in the drum, will react with atoms in the air resulting in the formation of crystal like skin structures. The “A” material should be sealed properly to limit the potential of these formations that if allowed to form will contaminate the liquid. Contamination may make the liquid impossible to process, requiring disposal and wasting of the product. Once the drum is opened, the air needed to replace the displacement of the “A” material being removed should be dry. This is achieved be either low pressure nitrogen being let in the drum as the material is displaced or filtered through a desiccant dryer.